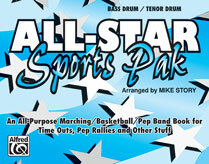 A great collection of the hottest and best songs for pep band, marching band or whatever your need, when spirited music is required. Short, 'to-the-point' versions by top arrangers fit into any situation. Titles are: 20th Century Fox Fanfare * NFL on Fox * NHL on Fox * Baseball on Fox * Louie, Louie * Wooly Bully * Hang on Sloopy * Shout * Bang the Drum All Day * Gonna Fly Now (Theme from Rocky) * All I Wanna Do * In-A-Gadda-Da-Vida * The Horse * MMMBop * Peter Gunn * Oye Como Va * C'mon 'n Ride It (Da Train) * Celebration * Celebrate * Fanfare/Star Spangled Banner. Artist: Chris Kenner; Antoine Domino; Jr.